LAND_Robot_Gladiator_Armed_lg, originally uploaded by huntarr. MARINE CORPS BASE QUANTICO, Va. — Science fiction movies have long used robots as a staple of their regular cast, but even now the Marine Corps is working on a machine that will operate forward of the front lines and provide scouting, flank security, direct attack and other tasks that will decrease risks for combat Marines. The Tactical Unmanned Ground Vehicle, or Gladiator, is designed to support dismounted infantry and combat engineers during the performance of their mission, across the spectrum of conflict and range of military operations. The Gladiator will provide the Marine Corps' Ground Combat Element with an unmanned tele-operated/semi-autonomous ground vehicle for remoting combat tasks in order to reduce risk to the warfighter and neutralize threats to the Marine Air-Ground Task Force. "This system is not intended to replace Marines," said Larry Hennebeck, the Project Officer, who works at Robotic Systems Joint Project Office in Redstone Arsenal, AL. "The Gladiator will give commanders another alternative to sending out Marines on missions that are very dangerous." 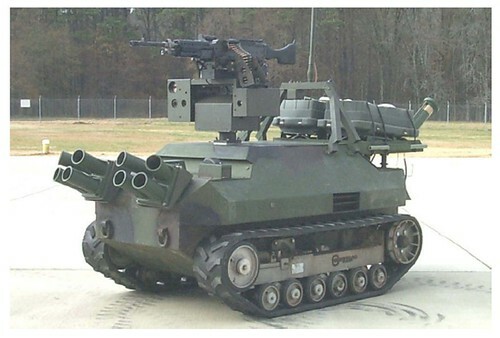 The Gladiator will be capable of performing scouting, surveillance, & target acquisition; direct fire; bunker/light-armor destruction; obstacle breaching; nuclear, biological & chemical (NBC) reconnaissance; employment of non-lethal weapons; obscurant delivery; engineer reconnaissance; and transporting ammunition or equipment. The Gladiator will possess day & night video cameras capable of performing as well as an individual Marine with currently fielded binoculars and thermal imaging equipment; an integrated position locating system and laser rangefinder capable of accurately determining the location of targets; acoustic detection system; and anti-tampering/handling devices. The operator will direct the Gladiator TUGV from a hand-held unit that controls the various platform/payloads and data reception from the sensors. This will provide the Gladiator with tele-operational capability for remote command and control of the vehicle as well as data display, storage and dissemination. UK army Alvis Stalwart Amphibious truck.